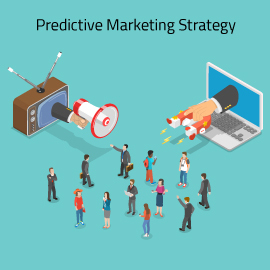 Are You Ready To Build a Predictive Marketing Strategy? In the era of digital marketing, most of the companies starting from enterprises to mid-level businesses have adopted marketing automation rapidly. They have already discovered, implemented and addicted to the value and deliverability of the marketing automation. In fact, Gartner predicted that 85 percent of customer relationships with business will be managed without human interaction by 2020. Now, what’s next after automation? to take your customer interactions to the next level with predictions, learning, and choices i.e an artificial intelligence(AI) driven marketing. But Forrester Research found that confusion and misunderstanding of AI-driven marketing are quite prevalent today. At the same time, marketers found the benefits of AI-driven marketing are quite appealing and enticing. There are few common factors which are overlooked most of the times while implementing any prediction model to your marketing automation system. Is your data clean and sufficient to make predictions? Looking at the craze and rapid adoption level of AI in marketing, most of the marketer wants to capitalize their marketing resources and optimize efforts to achieve a better ROI. To make a perfect prediction model for optimal output, it is highly required to have a clean and sufficient data. Before making a data model, the analysis and exploration of the existing database are necessary to make some hypothesis or recommendations out of it. If your database is having more number of missing fields, objects and value then the analysis may not be very fruitful. There seem to always be errors, dupes, or format inconsistencies. You may take help from any manual or automated data cleansing services to make sure that your data is ready for predictions. Are you tracking your campaigns effectively? Most of the marketing automation solutions are having a campaign tracking mechanism to track click-through’s, form submission, event registrations etc. Sometimes we miss tracking of click-through’s, form submission because of improper integration of tracking scripts with the landing pages. In that case, you may miss the opportunity to make a model on the basis of your conversions. Marketers must move beyond campaigns aimed at customer acquisition and understand that every single interaction with your brand provides an opportunity to learn what your customer is trying to accomplish at that moment. Are you using right historical data to drive AI based marketing? To cope up with sudden changes likes trends or fads in the marketing, you should use data from your recent past to make the predictions. All your effort in building the data model might go in vain if you are including your old database in the model. Your AI driven machine learning algorithms should make specific conclusions while accessing your data, not generic recommendations. The choices you make with those predictions are equally helpful for your model. A prescriptive analytics led by predictive analytics will let you know how you can arrive at the conclusion level. This prescriptive analytics largely depends on your historical data. According to Gartner, the spending on AI globally will be around $28.96B by 2021. Your predictive model can make significant decisions based on the inputs you provide in real time as well as from the past. While a robust ecosystem of prepackaged APIs, open-source software, and cloud-based platforms is helping accelerate AI adoption, you need to consider this basic factors which can improve your prediction results at the same time. This entry was posted in Artificial Intelligence, Marketing AI, Predictive Marketing. Bookmark the permalink.